Primary Function: Initial mission was as mach 3 bomber, reassigned as test bed to test principles of compression lift. Six (6) General Electric YJ93-GE-3 turbojet engines. Each engine capable of producing up to 31,000 lb (14,060 kg) thrust (with afterburner). Speed: 2,056 mph. (Mach 3.1) at 73,000 ft. 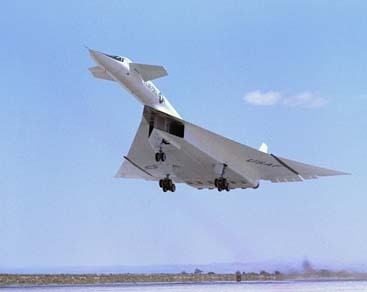 The XB-70 was one of the world's most exotic aircraft. Used a phenomenon called compression lift, which is caused from the shock wave generated by the airplane flying supersonically supporting part of the aircraft's weight.